Last week Bill emailed me saying that some folks who work with Biovex baits would be in the Raleigh area on their way to Hatteras for vacation. They had a free day to fish on Sunday and wanted to do something out of the ordinary. For them, "the ordinary" is fishing heavy grass mats, lily pads, and flats - catching big bass, redfish, and other species. After some debating, we figured what would be better then taking them out on a small river for an adventure off the beaten path. Since their time was limited, we only had a few options that would fit the bill and get them back to their hotel then to the beach before dinner time. To complicate matters further, the isolated storms again had the gauges all over the place. 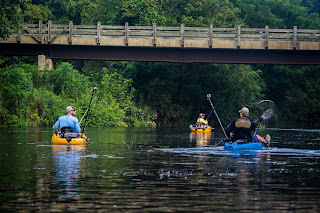 We ended up heading toward Raleigh to fish a flow I had only fished once before. It was a river that I knew would hold some fish, but I wasn't sure what it would look like because it doesn't have any gauges close to where we were launching. We arrived to find the water nearly 3.5 feet higher than normal and I wasn't sure how it would turn out.....but we left smiling. Bill and I's guests were Christina and Troy Weber. They currently live in Orlando and have a diverse fishing background. They rep Biovex Baits, among other companies in the fishing and kayaking realms. As with anyone you meet via mutual friends or online, there is the intial, "feeling each other out" period. This involves things like finding out if you can swear around them, whether they were going to need a lot of instruction, and making sure they aren't serial killers. Thankfully, Christina and Troy got thumbs up across the board. The launch at this spot is kind of tricky. It involves dragging boats about 40 yards, then maneuvering a sloped boulder field to the river. We got the two Malibus and their Hobies down to the water and pointed the noses upstream. Despite the high water and increased flow, the water wasn't overly dirty, which was a pleasant surprise. It didn't take long before Troy got on the board with a chunky river bass that ate a topwater. We got to know each other as we slowly fished our way up the banks. Then, before I even realized what was going on, I heard Bill yelling to get the net. Since I was the only one with a net, I assumed he was yelling in my direction. At the time I was helping to retrieve a lure and by the time I got to Bill the fish was already in the boat. It was a beast. The fish had nailed a black worm that Bill had cast to a rock bluff. We snapped a few photos and weighed the fish - around 6 lbs. I think we were both a little torn about how to feel. We were stoked to have caught a 6 lber, but when you get one that early in the day, especially on a day with crazy conditions and on a river you don't know overly well, you don't want to give the impression that there are 6 lbers all over - leading to getting hopes up only to be crushed throughout the day. Shortly after Bill caught his fish, we learned that the Webers were in a friendly competition with two friends back in Orlando. The friends were out on renowned big bass spot Lake Kissimmee in central FL. They were also fishing out of a bass boat. The competition was most weight in a 5 fish limit. No pressure. The next bit of the day was a little slow before I landed a 14" bass on a crankbait. Then we came to a spot that threw a wrench in our plans. The river was narrow and raging through the small channel. Above the chute, you could see what were normally calm pools that looked more like a wave tank. I beached my yak and scouted the pools. I figured our options were either to a) portage the yaks around the chute and fish the pool areas, b) turn around and try fishing downstream from the launch (where we had never fished before) or c) pack up and go to another river. The group voted to go the adventurous route - portage to the pools and if it stunk we would try down from the launch. The portage went well. I got within about 20-30 yards of 4 bucks - one of which was a very, very nice 12 point. Unfortunately the fishing was not as hot. Troy caught 2 bowfin on a jig and I caught 2 catfish on a Premier Leagure Lures River Series spinnerbait. The high water had made it so that there weren't any real areas in the pools to get out of the current, so the bait and bass were spread all over. I finally managed 3 bass - all around 2 lbs - by drifting a black stick worm. I also managed to lose a couple fish on a dropshot. We ended up catching a bunch more catfish before we decided to head back down river. We needed to shoot some photos, so we stopped near a big eddy to do some glamour work. 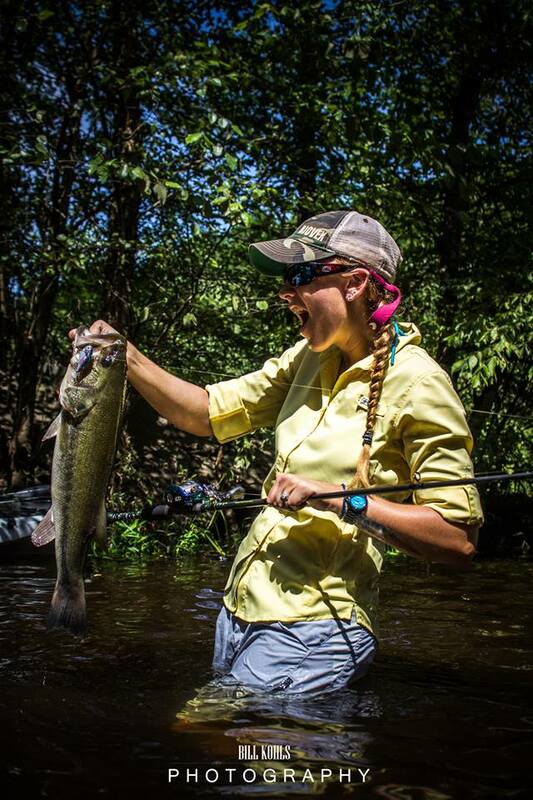 Christina started casting along a current seam with the Biovex lipless crankbait. She was yo-yoing it when her rod doubled over. She played it cool, but I could tell it was a good fish. However, the longer she kept a straight face, the more I thought it wasn't as big as the bow in her rod made it appear to be. Then it came out of the water and all of us dropped simultaneous f-bombs. I grabbed the net and Bill started snapping photos. The lure was lodged squarely in the corner of the mouth and we got the fish to the net with ease. After taking all sorts of photos we put the fish on the scale. It was another 6 lber. I was stoked that we had got into another good fish and the brute put our 5 fish weight at 18 lbs. I don't have a pic of this fish. I think it is going straight to the Biovex catalog. *Update* - below is a shot from Bill Kohls, although it does the fish no justice from that angle. 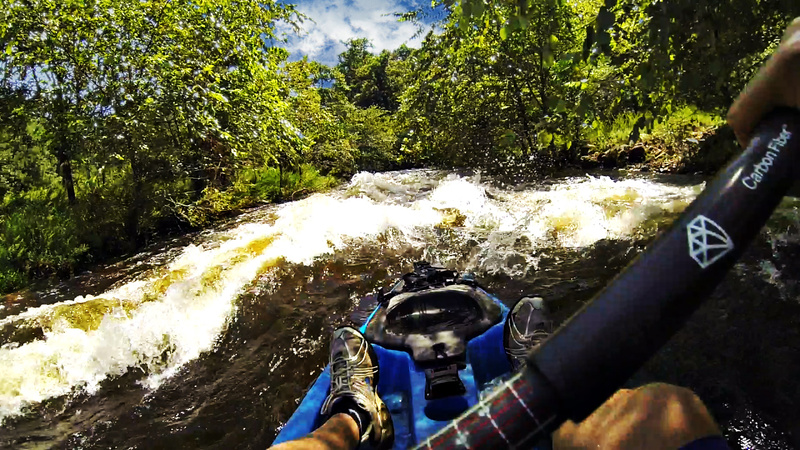 After running some rapids, we headed down to the next big eddy. I tied on a flat sided, silent, balsa crank with a coffinbill - the kind they just don't make anymore. I cast along a seam and barely turned the handle before the bait got crushed. It was a solid fish that put up a nice fight before I could wrangle him in. He pulled 4.5 lbs on the scale and would cull out one of the 2 lbers from our limit. We were up to about 20.5 lbs - a more than respectable weight. I didn't even bother with a picture. In fact, this summer has been so good, I haven't even bothered taking pics of 4 lbers the entire time. We have caught so many big girls that there just isn't a reason to. We continued to work the area and managed 5 more bass on cranks and buzzbaits. The rest of the float was fairly quiet other than a couple short fish. We got back to the launch where Christina and Troy decided to call it a day. We shot the bull for a while longer and then Bill and I decided to explore down river. Over an hour later, we got back to the car, exhausted from fighting the current (both paddling and wading) and with only a couple small bass to show for it. We packed up, exhausted from fighting the flow all day, and headed for home. I am not sure how our total weight held up against the Floridians, but I can tell you that even if we lost, it was a lot of fun. 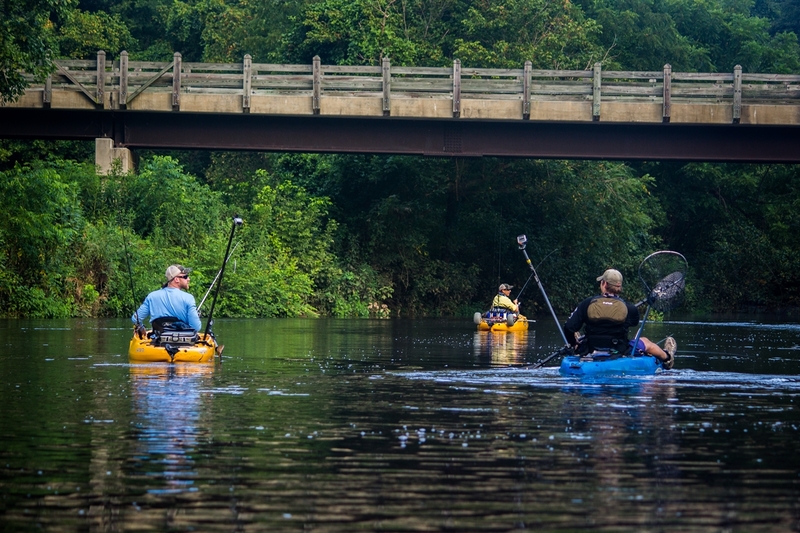 The awesomeness of the kayak fishing community is vast and Sunday was the perfect example. It was a great learning experience for me and although the day didn't go as well as I had envisioned, I really can't argue much with the results. A big thanks to Bill Kohls Media, the Webers, and Biovex for a fun day. The Malibu Stealth 12 handled rapids like a champ and continues to impress me as an all-around fishing machine. If you would like to get out on a river, chase some big fish, have some fun, and let us pass our knowledge on to you, head over to Froggy Waters Outdoors and give us a shout to book a guide trip. There will be some river giants caught this fall - mark my words. I'd call 2 six pounders a nice day.